If damp-proofing treatment is budget-priced, there’ll be a reason for it and householders will be paying the price sooner than you might expect, says Jonathan Kirby, Development Chemist of Safeguard Europe. If a damp-proof treatment has failed, we tend to assume that it must have been installed decades ago, when application technologies were less advanced. This isn’t necessarily the case, however. Budget damp proof creams with low concentrations of silicones – the all-important active ingredients – simply can’t match the performance of those with high concentrations. They may look the same, they may contain similar ingredients, but it’s the proportions that matter. The percentage of active ingredients varies hugely between creams, from over 60 per cent to below 15 per cent. Some of the walls that have been treated with lower-concentration damp-proofing cream may be no drier than before the treatment was carried out. However, with a sand and cement render covering the offending areas, no-one is any the wiser until a few years down the line when the rising damp starts to creep through. Aside from the damage to the fabric of the building, decorations and furnishings, damp has negative implications for health. It can encourage the growth of mould, which in turn can lead to respiratory illnesses, with the very old and the very young particularly vulnerable. Damp walls also increase heat loss. For instance, bricks have twice the thermal resistance when dry than when wet, making them insulate more effectively. 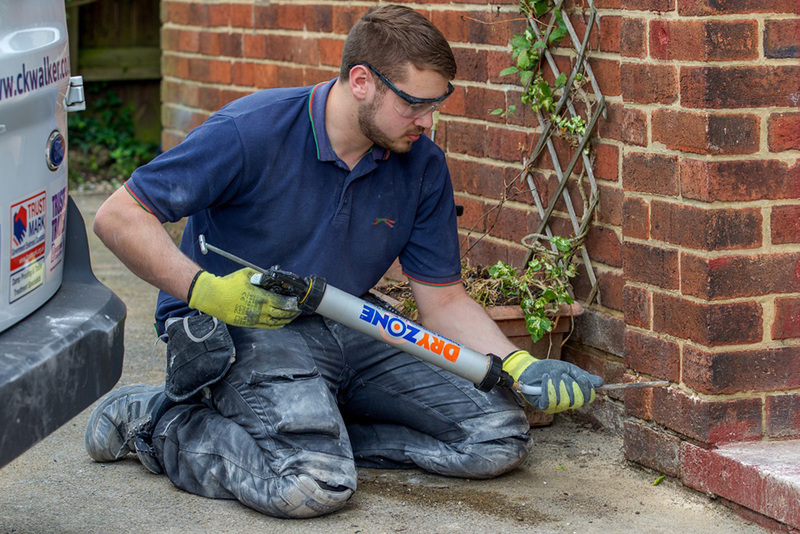 Damp-proofing creams are the most widespread method for retrofitting a damp-proof course (DPC) to protect against rising damp. Retrofitting a DPC could be necessary because the original physical DPC has degraded or been ‘bridged’ by raised ground levels (e.g. newly laid paths or patios). 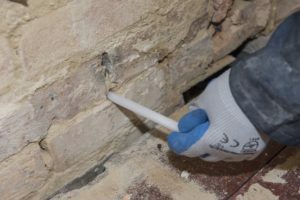 Houses from the Victorian era and earlier were usually built without a DPC, so a retrofit DPC may be required to deal with resultant rising damp issues or to bring a building up to the standards required by modern building regulations. Creams took over from an earlier system which involved injecting liquids at high pressure into holes drilled into the bricks. Although this method could be effective, it required patience and diligence, which were not always applied. Safeguard launched the first ever damp-proofing cream, known as Dryzone, nearly two decades ago in the year 2000. Containing similar silicone active ingredients to the older liquid damp-proofing products, creams offer several benefits. Creams are low hazard compared with older liquid technology. They are easier to apply, injected into the drilled hole with a gun until the cavity is filled; there’s no need to force the substance in at pressure because the active ingredients are drawn into the wall by diffusion. The creams create a damp-proof barrier by spreading through the mortar course to deliver the active ingredients, which then bond to the masonry, creating a hydrophobic layer to control the rising damp. However, the challenge can be ensuring that those active chemicals diffuse far enough. Sufficient spread between the injection holes is necessary to ensure that there is an adequate hydrophobic layer. Using a cream with the right mix of active ingredients and at a high concentration will deliver optimum performance. The other issue is that the amount of moisture in the wall impacts the diffusion process. Low strength creams have been shown to have poor diffusion qualities in highly saturated walls. High strength creams that use the correct combinations of silanes and siloxanes are better equipped to mitigate this. Dryzone has been proven and accredited by the WTA to work effectively in walls saturated above 95%. UK testing and certification does not distinguish between the different performance levels. Comparative testing on a range of products allows these differences to be shown. An alternative to creams, which has shown to be especially effective is Safeguard’s patented Dryrod Damp-Proofing Rod system. This comprises of solid fibre rods, impregnated with reactive silicones of low molecular weight. Once inserted into the drill holes, the rods allow for more efficient diffusion of the silicone molecules – resulting in a more effective treatment. Research carried out at Portsmouth University demonstrated the relative efficacy of the rods, high-concentration creams and low-concentration creams. The researchers treated brick ‘burgers’ – two bricks bound together by mortar – with a range of damp-proof products and then put them in a shallow tray of water, around 4mm deep. They then measured the increase in weight of the various burgers over nine days. The difference in results is quite marked. The specimen treated with Dryrod had its water absorption reduced by >98 per cent after nine days of testing. Dryzone Cream, which has a high concentration of active ingredients, came a close second – with a reduction in water absorption of 95 per cent. However, the low strength cream performed very poorly only reducing the water uptake by 31 per cent demonstrating that it provided minimal resistance to rising damp. Dryrods are also ideal for solving previous cream treatment failures. When a chemical damp-proof course has failed due to the use of a low-strength damp-proofing cream, it can be difficult to retreat. When using water-based creams, it is usually required that the retreatment takes place on a separate mortar line to the original treatment. Even though it has failed, the original mortar line will still be minimally hydrophobic and will impede the diffusion process. Thanks to the patented delivery system, Dryrod Damp-Proofing Rods are not water-based and can be installed on the same mortar line as the original failed damp-proof course using the same drill holes as the original treatment. The user can also be safe in the knowledge that the correct amount of active ingredient is being delivered. The bottom line is, it is important to use the appropriate materials for the job. Budget low-concentration damp-proofing creams are a false economy. They can cause more problems than they attempt to solve and lead to callbacks and extra cost. 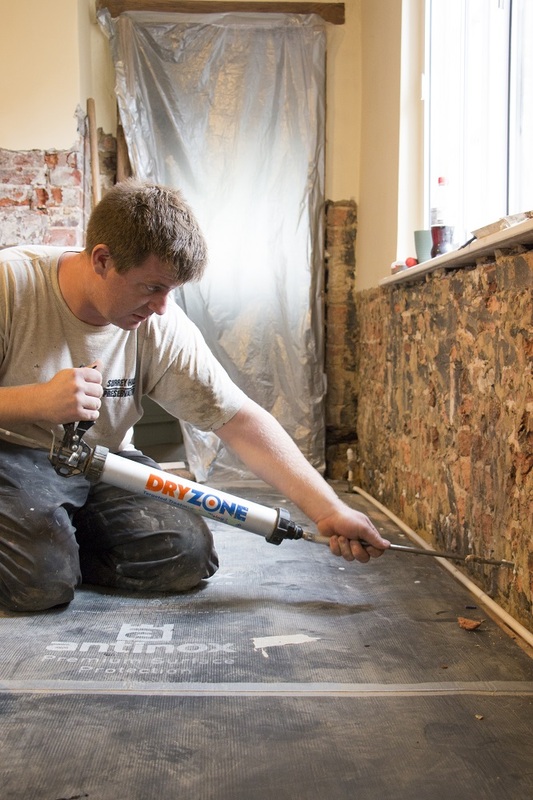 If you use tested high-strength solutions, such as Dryzone Damp-Proofing Cream or Dryrod Damp-Proofing rods, you can be safe in the knowledge that you are creating a long-lasting and effective damp-proof course.